These whole peeled tomatoes are what most people think of when they think of canned tomatoes. They are quickly blanched in hot water, peeled, stuffed into jars, covered, and boiled to seal the jars. There's no point in telling a lie: the process takes some time and is a bit of a hassle, but it doesn't require any special skills. Anyone with an excess of ripe tomatoes can do it. You may want to check out this list of canning equipment before you get started. Bring a large pot or canning kettle full of water to a boil. While the water comes to a boil (which will take awhile), use a sharp knife to cut a small "x" in the bottom of each tomato. Prepare a large bowl of ice water and set it near the pot. Once the water is boiling, put the tomatoes in. Cook them for about a minute, then lift them out with a slotted spoon, and transfer them directly into the ice water so they can cool quickly. As soon as the tomatoes have cooled off enough so that you can handle them easily, use a sharp paring knife to remove the tomato skins. Having blanched them, the skins should slip right off without too much fuss. Bring the water back to a boil, put the jars in the canning rack, and boil the empty jars for 10 minutes to sterilize them. Put the lids in separately, also for 10 minutes, to soften the sealant. Remove the jars from the water (empty any water back into the pot and bring back to a boil). Put a tea kettle full of water on to boil. While the water is boiling, put 2 tablespoons bottled lemon juice in each jar. Stuff the jars evenly with the tomatoes. If you don't care how "whole" they are in the end, really cram them in there, releasing the juices from some to create enough liquid to cover them. Cover the tomatoes with boiling water from the tea kettle, if needed, leaving 1/2 inch of headspace at the top of the jars. Wipe the edges of the jars clean and place the lids and rims on the jars, set the jars in the canning rack, and lower them into the boiling water in the canning kettle or other large pot. Cook, with the water boiling the whole time, for 45 minutes. Remove cans from their water bath and set them on a counter to dry and cool. Store jars in a cool, dark place until ready to use. While in pretty much every other instance, fresh lemon juice is the way to go, when it comes to canning tomatoes use bottled lemon juice. Bottled juice has a standardized, consistent acid level necessary to keep the tomatoes from spoiling. Also note that sealable lids should not be re-used, although jars and rings can be. Buy new lids every time you can. 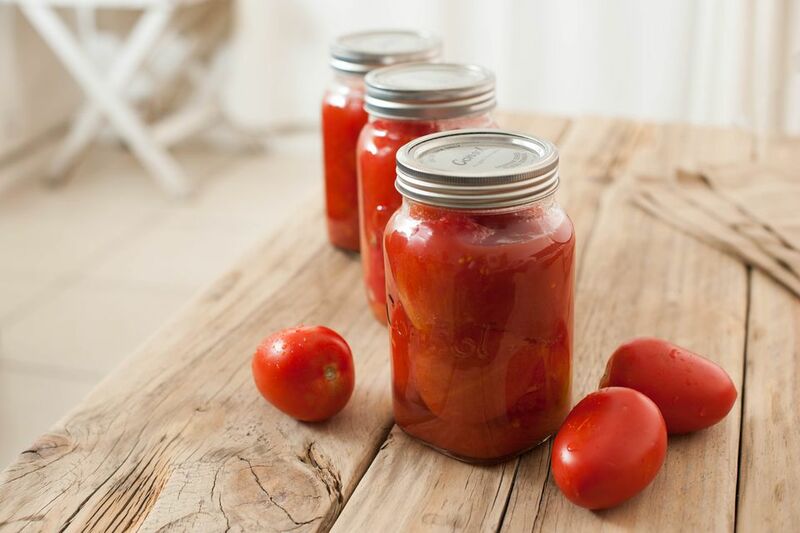 See more about canning safety tips. For the tomato skins that you remove in Step 6, while most people discard these skins, know that you can dry them out into "chips" by laying them in a single layer on a baking sheet and putting them in a 200 F oven until they're crispy. It takes a few hours and is highly dependent on how humid the climate is, so check them every 30 minutes or so after the first 2 hours. They make for great snacking.